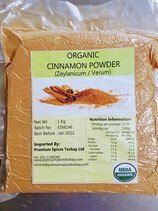 We offer real Cinnamon (Ceylon) as organic. The highest quality cinnamon comes from the trunk, and lower quality comes from the side branches. Finally ground cinnamon is smooth, not gritty and this is indicative of good quality cinnamon. Cinnamon has a warm, sweet, slightly clove and citrus like delicate flavour and has a more delicate flavour than cassia. Cinnamon has calcium, potassium, manganese, iron, magnesium and Vitamin C.
European and Mediterranean regions primarily use the ground form of cinnamon. Asian and Latin American countries use whole and ground forms. Cinnamon pairs well with tomatoes, onions, yogurts, nuts, bananas, oranges, peaches, apples, grapes, chocolate, corn, and cauliflower. It is used in its ground form in fruit based confections, cakes, pies, cookies, buns and breads. However, watch out overcooking makes it bitter. Available by 100g, 500g and 1kg. Simple use the Drop-Down box to change the size.